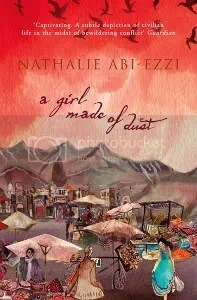 A rich and beautiful novel set during the Israeli invasion of Lebanon in the early 1980s, and based on the author’s personal experiences of the conflict. Ten-year-old Ruba lives in a village outside Beirut. From her family home, she can see the buildings shimmering on the horizon and the sea stretched out beside them. She can also hear the rumble of the shelling — this is Lebanon in the 1980s and civil war is tearing the country apart. Ruba, however, has her own worries. Her father hardly ever speaks and spends most of his days sitting in his armchair, avoiding work and family. Her mother looks so sad that Ruba thinks her heart might have withered in the heat like a fig. Her elder brother, Naji, has started to spend his time with older boys — and some of them have guns. When Ruba decides she has to save her father, and uncovers his secret, she begins a journey which takes her from childhood to the beginnings of adulthood. As Israeli troops invade and danger comes ever closer, she realises that she may not be able to keep her family safe. This is a first novel with tremendous heart, which captures both a country and a childhood in turmoil. I was rather disappointed by this book, there was little sense of what it felt like for a child living during a war, and while there was some impression of her ideas around why the war was happening there was litte about how she felt about that it actually was happening, in fact there was only really one point where I got a good sense of this. I don’t feel the blurb represented the book very well really. Yes Ruba grew up but I saw little connection with her Father’s secret, and while the secret was something important for understanding her Father I felt it had little to do with her growing up, or at least less that the impression given by the blurb. [Highlight for spoiler]As for The Girl made of Dust herself we never found out who she was which was a bit disappointing. The problem caused by her death seemed to suddenly disappear with the appearance of Amal in Ruba’s father’s life but I really don’t understand why, she can’t have been the girl because the girl was dead! I did quite like the voice of the book though, it seemed to fit a girl of Ruba’d age quite well and was engaging. It reminded me somewhat of the tone of The Cure for Death by Lightening which was one of my favourite books last year.